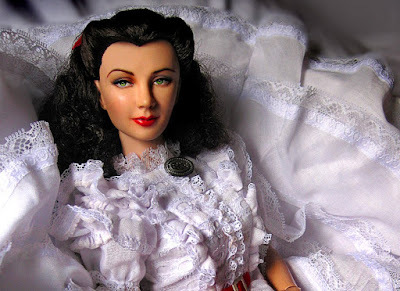 Portrait of Tonner Scarlett O' Hara "Waiting for Pa". Shot with available light on 10 Megapixel Canon Camera. Light has been enhanced by Photoshop. 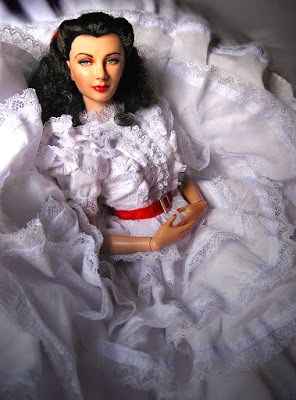 Tonner recently announced its GWTW line for 2009. While there were some interesting additions such as the lost costume "Travelling with Mother to Savannah" (which seems not to capture the attention of Scarlett doll enthusiasts), most of the releases were not all too new in our eyes. "My Mother's Portieres" is a recreation of the overly done versions of the "drapery" dress. I think its because people like seeing an icon like Scarlett continuously refreshed -- just like any strong brand in the market. There is a point when a new version is not exciting anymore, no matter how new the interpretation may be. But personally, I think the cut and the fit seems interesting although not persuasive enough for me to get it. 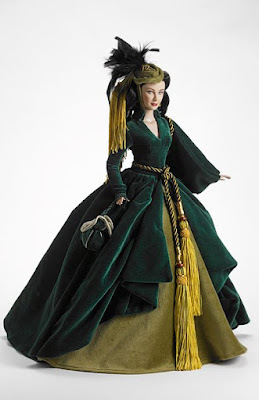 Tonner's Drapery dress seems to boast of a full velvet look, unlike Franklin Mint's which uses shiny silk and IMHO, lacks the fit that GWTW shows on Vivien Leigh. The doll that comes together with the drapery dress seems to have loose curls which seems to be more interesting to some, than the dress itself. "Don't look back" is the blue and white ensemble which is worn briefly on the film and hardly for me a Civil War costume. Plunkett seems to get carried away with his designs often designing with a "hollywood-ish" look than adhering to reality; even if Ms. O'Hara was known for her ostentatious choice of clothing, the styles and choice of color are not reminiscent of the 1800 -- late 1800's era. One would think that Scarlett on film was starring in a musicale. Nevertheless, the "Don't Look Back" ensemble is an elegant piece that makes the doll look stunning. 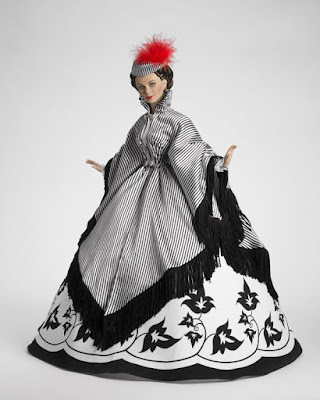 What shocked the GWTW doll collectors was the price of each doll/dress going over $200!! An inconsiderate move in face of a dark economic scenario, and way over the budget of a doll collector. There were points raised -- valid i.e., to sell the dress separately which could lower the cost. 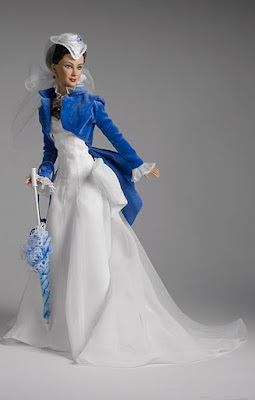 Actually, both doll and dress come in a large box which increases shipping costs.The Basic Mrs. Butler could actually work for "Don't Look Back", and "Travelling with Mother to Savannah"; the Basic Scarlett on the other hand can work for the new Tonner version of the Drapery dress. Why they didn't sell it separately as Franklin Mint did is beyond me. I think it should have been a consideration in the Tonner meetings about pricing. Should we all wait in ebay for these collections to be sold separately? And bid incessantly, be at the mercy of some sellers? Should we even get a dress even if we already have a similar one from Franklin Mint? Who knows what one can do when one is infected with "Scarlett fever". Or the unseen costume worn by Scarlett in the unseen ending. I can't agree with you more !!! ...and I can't help but feel the same way you do about the pricing Eric! Will the real Rhett Butler please stand up!